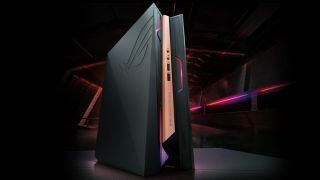 Asus has revealed its new ROG GR8 II compact gaming PC which the company claims is the world’s smallest VR-ready machine. Described as a console-sized machine with full desktop power, the 4-liter rig comes equipped with up to a Core i7-7700 Kaby Lake processor, backed with up to 32GB of DDR4 system memory and a GeForce GTX 1060 graphics card. Storage comes courtesy of an M.2 SSD (up to 512GB in size) and an up to 1TB hard disk of the 2.5-inch variety. The PC has dimensions of 88 x 299 x 281mm and weighs 4kg. Asus notes the machine is designed with VR in mind, so has been tested thoroughly with the Oculus Rift and comes equipped with two HDMI ports and a DisplayPort, so you can hook up a headset and monitor at the same time (or indeed three displays, should you wish). Speaking of the company’s testing, it found that the GR8 II performed no less than 47% faster than a similar gaming PC with a previous-generation GTX 960. Asus also says that its machine ran Overwatch in full HD at frame rates which averaged around 70 fps. The GR8 sequel is equipped with a nifty cooling system featuring dual fans, copper heat pipes, along with strategically placed vents and chambers ensuring optimal airflow. It’s also designed to be very quiet, keeping a lid on fan noise and producing a claimed 23dB when idling. We’ve seen the ‘spacecraft-inspired’ theme for the case before, and while it might not appeal to everyone, there’s no denying it’s a striking look, complete with Aura Sync RGB lighting in three different areas on the front of the PC (which can be fully customized to change depending on the game you’re playing). It’s not clear yet when the ROG GR8 II will go on sale, and indeed the price hasn’t been confirmed either, but hopefully we’ll hear soon enough. You might also want to check out the VivoPC X which Asus revealed at CES, a compact gaming machine which is powerful enough for VR duties and will arrive in March.